We continue to receive inquires throughout the state regarding green ash (Fraxinus pennsylvanica) trees being fed upon by populations of the brownheaded ash sawfly, Tomostethus multicinctus. This is a sporadic, early season, defoliating insect pest that appeared in Manhattan, KS in 2013. 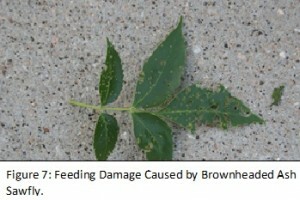 Populations feed extensively causing noticeable foliar damage and producing lots of frass (sawfly poop). 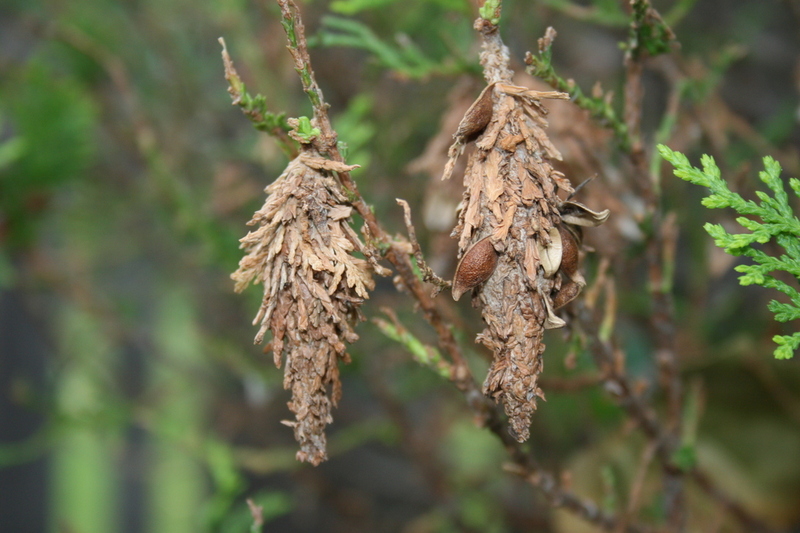 segment with no crochets or hairs on the feet, which distinguishes them from caterpillars. 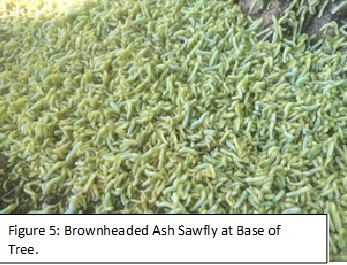 Brownheaded ash sawfly larvae feed primarily on ash trees (green and white) (Figure 3). 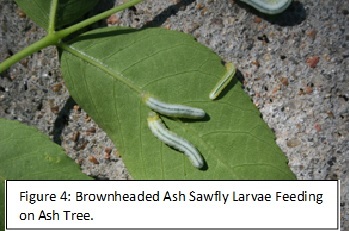 Brownheaded ash sawfly pupates in the spring, with adults, which are wasp-like in appearance, emerging and females laying eggs inside leaves. 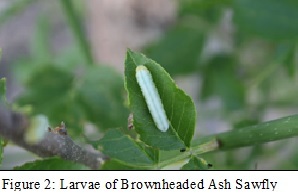 Eggs hatch into larvae that congregate into massive groups at the base of trees (Figures 4 through 6), and feed from May through June. 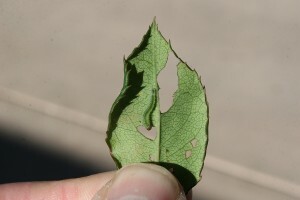 The larvae create shot-hole or pin-hole damage on leaves when young (Figure 7), but as they increase in size, the larvae consume entire leaves, especially terminal leaves (except the main veins), resulting in almost complete defoliation. The larvae are full-grown by June and shed a paper-like skin that is attached to the leaf (Figure 8). Larvae then migrate toward the base of the tree, enter the soil, and form a protective cocoon. 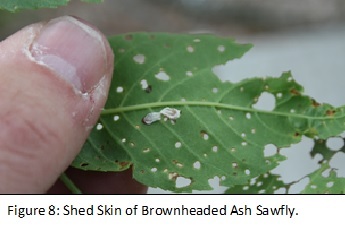 Brownheaded ash sawfly overwinters as a full-grown larvae or pre-pupae within silken-lined cells located in the top portion of the soil at the base of previously infested trees. 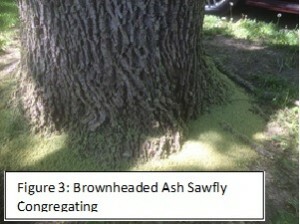 High numbers may congregate at the base of trees. There is one generation per year. In general, it is not warranted to spray an insecticide unless populations of brownheaded ash sawfly larvae are excessive and causing substantial damage to ash trees, which is contingent on the size or age of the tree. 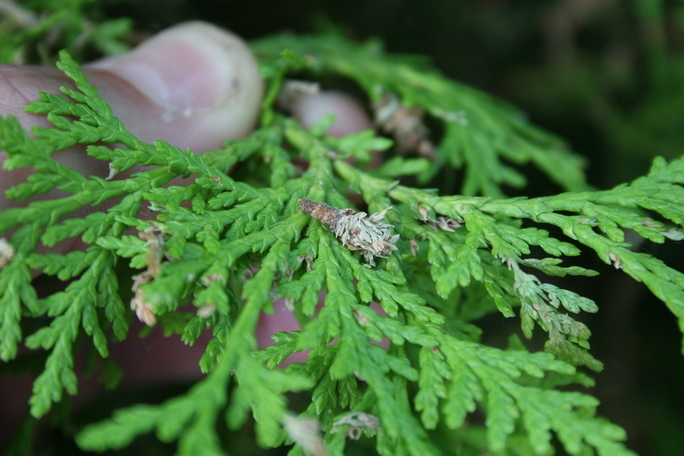 It is interesting to note that rainfall will quickly remove larvae from trees. 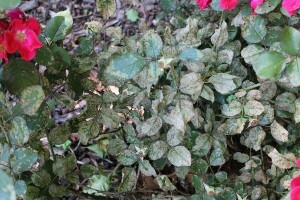 In fact, a forceful water spray will dislodge larvae, which fall to the ground, and then are subsequently consumed by birds. If necessary, insecticides may be applied that contain the following active ingredients: acephate, bifenthrin, carbaryl, cyfluthrin, lambda-cyhalothrin, permethrin, petroleum oil (horticultural oil), potassium salts of fatty acids (insecticidal soap), and pyrethrins. These are all contact insecticides so thorough coverage of the tree canopy is important. Since this insect is a sawfly, insecticides such as Dipel or Thuricide that contain the active ingredient, Bacillus thuringiensis subsp. kurstaki will not be effective (refer to the previous issue of the newsletter). 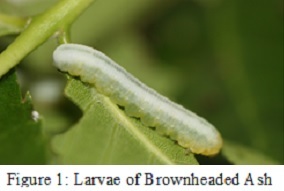 Be sure to assess the numbers of larvae present in order to determine if sufficient damage is occurring to justify the application of an insecticide. 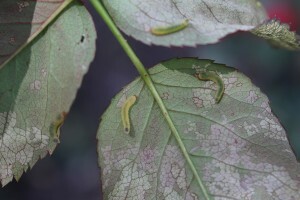 Caterpillars are the larval stage of butterflies and moths; whereas the larval stage of sawflies is greasy looking and slug-like with the adults resembling wasps. Remember, caterpillars are in the insect order Lepidoptera (butterflies and moths) whereas sawflies are in the order Hymenoptera (ants, bees, and wasps). 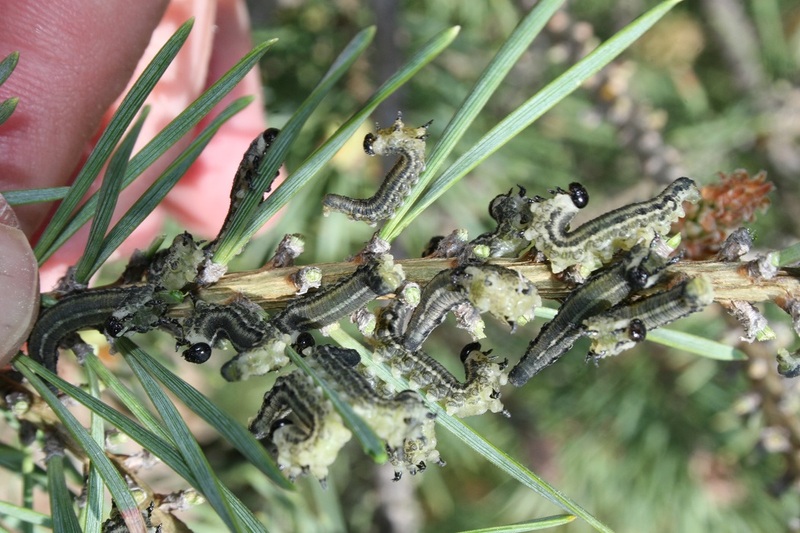 There are a number of caterpillars and sawflies that feed on horticultural crops. 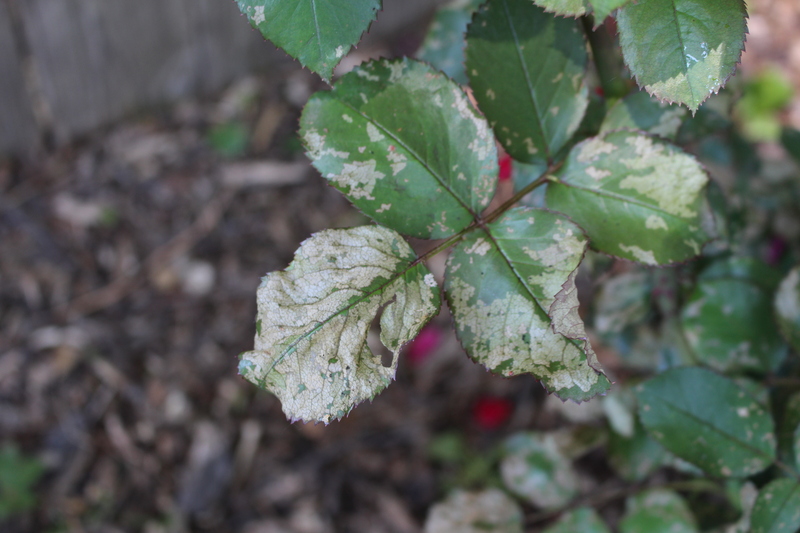 Common caterpillar pests include bagworms, eastern tent caterpillar, fall webworm, mimosa webworm, yellownecked caterpillar, walnut caterpillar, cutworms, European corn borer, and tomato/tobacco hornworms. 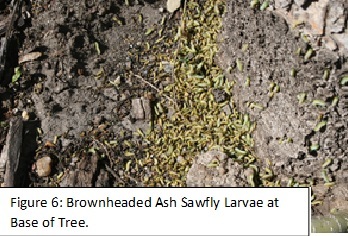 Sawflies that feed on plants include the European pine sawfly, brownheaded ash sawfly, rose sawfly, and scarlet oak sawfly. 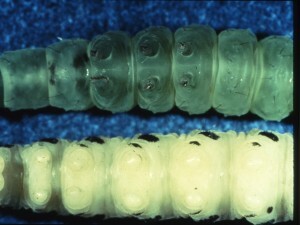 Sawfly larvae resemble caterpillars; however, there is a difference. 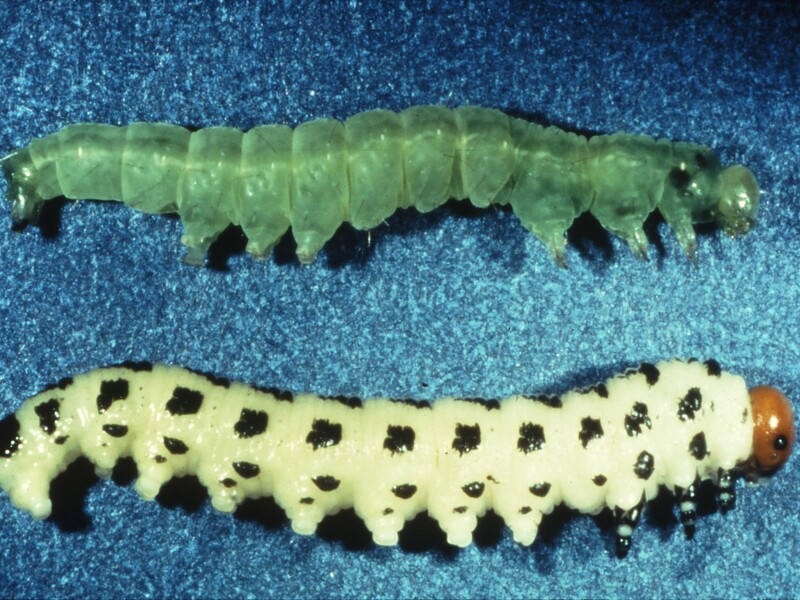 There are two ways to distinguish between caterpillars and sawflies. 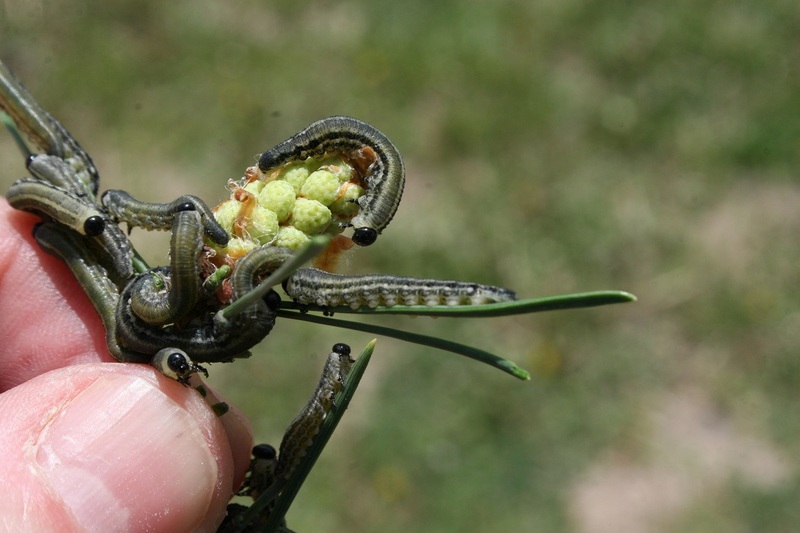 First, sawfly larvae have prolegs (stubby-looking legs) on every segment of the abdomen whereas caterpillars are typically missing prolegs. 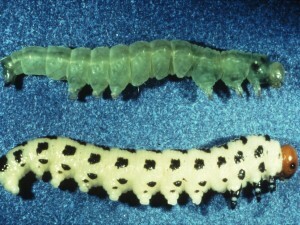 In Figure 1, a caterpillar is on the top and sawfly on the bottom. Second, caterpillar larvae have hairs or crochets on their feet while sawfly larva do not have hairs or crochets on their feet, which is shown in Figure 2, with the caterpillar prolegs on the top and sawfly prolegs on the bottom. Why is it important to know the difference between caterpillars and sawflies? 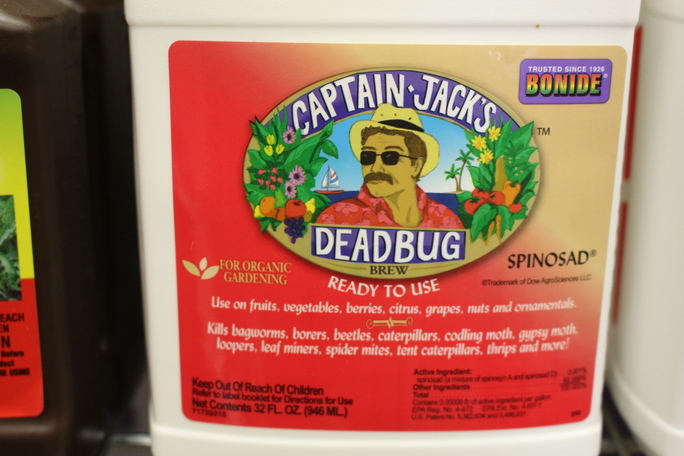 Well, one of the common insecticides recommended for use against young caterpillars is Bacillus thuringiensis subsp. kurstaki that is sold under many trade names including Dipel and Thuricide. This is a bacterium that must be ingested or consumed by the target insect pest, in this case, caterpillars, in order for death to occur. 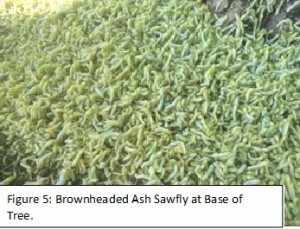 However, the insecticide has no direct effect on sawfly larvae. 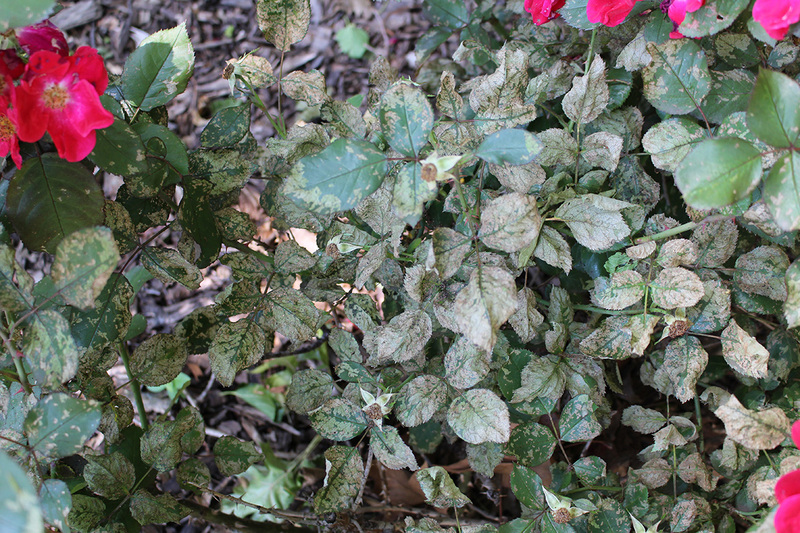 Therefore, it is important to correctly identify the “caterpillar-like” insect before selecting an insecticide. 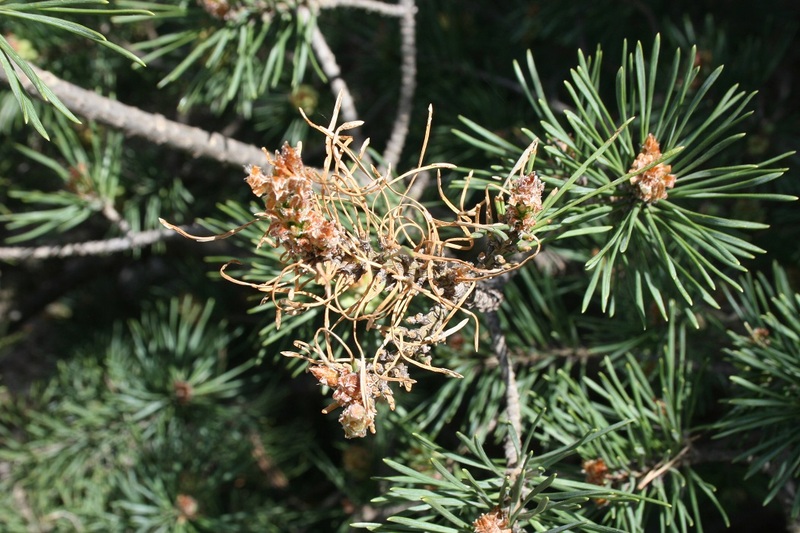 Specimens may be sent to Kansas State University, Department of Entomology (Manhattan, KS) or the Kansas State University Diagnostic Clinic in the Department of Plant Pathology (Manhattan, KS).